A 3.5 x 4 inch beauty salon magnet with square cornered edges serve as a best promotional aid for beauty salon and spa owners. This type of beauty salon magnet is especially favored by newbie salon services because it helps them to gain easy attention. 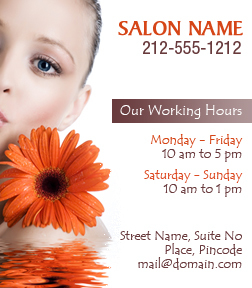 Beauty salon magnets are often favored by customers due to their appearance and easy contact details that they offer.